Today, all types of businesses are turning to Cloud Computing; a cost-effective, Internet-based thus greener, and, ultimately, more efficient way of accessing technology-enabled services. Cloud Computing may seem complex to understand at first as it is a relatively new yet rapidly unfolding platform being adopted by the corporate world. What Cloud Computing does exactly is transform traditional computing methods (applications, networking, storage etc.) into a shared pool of resources through the Internet’s virtual highway as opposed to having all of your computer hardware and software located somewhere inside your company’s network. This means that all the hardware and software, where it is all located, and how it all works is irrelevant to you, as the user, as it is all being dealt with somewhere in this “cloud” which is represented by the Internet. How can Cloud Computing benefit my business? Ultimately allow your company to rapidly adjust to changing marketing dynamics on par with alternating trends. 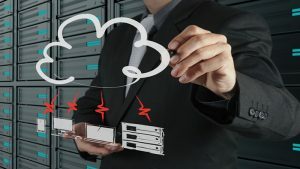 Selecting the right type of cloud computing service is extremely important in order to allow your business to manage the right resources at the right time, safely, and with high levels of security. Contact us today to find out more on how we can help you select the right type of cloud computing service to benefit your business’ IT needs and priorities. © Copyright CyTechnology Ltd 2018. All rights reserved.